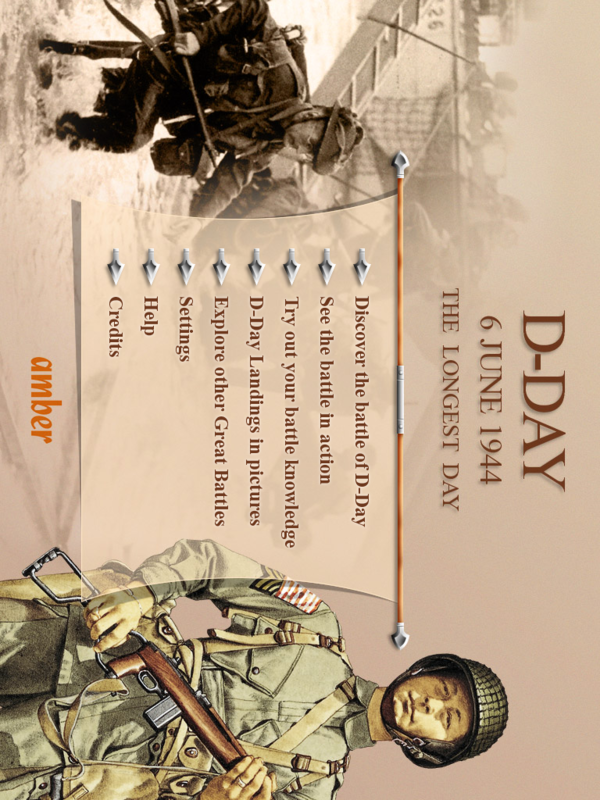 Great Battles: D-Day – A Victory for iPads Everywhere? D-Day, one of the greatest allied victories in WWII, is soon approaching it’s 67th anniversary. How are you going to celebrate? 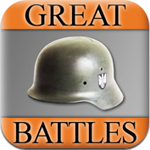 Well, you could download Great Battles: D-Day for iPad! 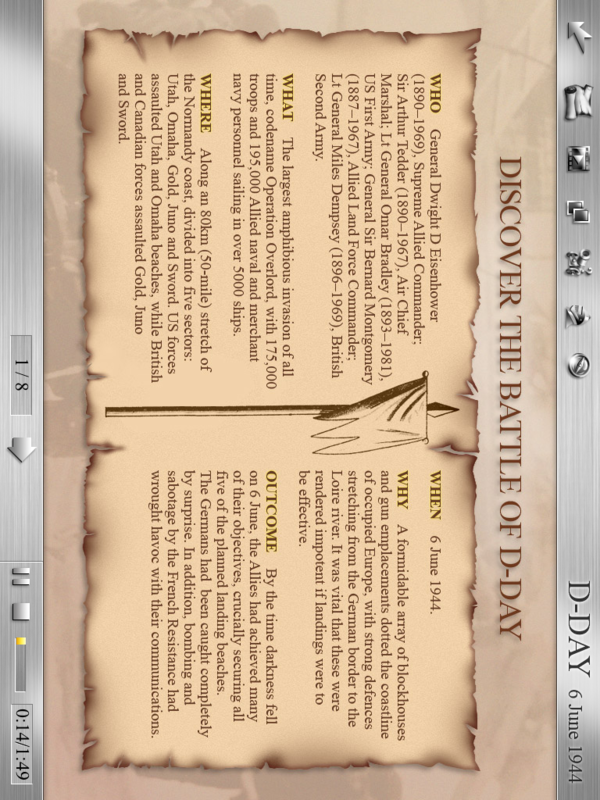 The app is one in a series containing info about important battles in American wars. Great Battles: D-Day is centered completely around the storming of the beaches of Normandy. The app allows you to view and interact with different parts of the battle, and if you’re one of those illiterate types, the app will even read aloud to you! (Although I don’t know how you’d be able to read this review). Inside the app is six different sections: the who, what, when, where, and how of the battle; an interactive review of each stage of the battle; photos and paintings from that period; a quiz section; the total number of soldiers on each side; and a map of where D-Day went down. The first two sections are full of information, unfortunately, the same cannot be said about the other sections. The photos section is very lacking on actual pictures, and the last three, seem to be late additions that definitely need more content. The app is pretty easy to navigate. 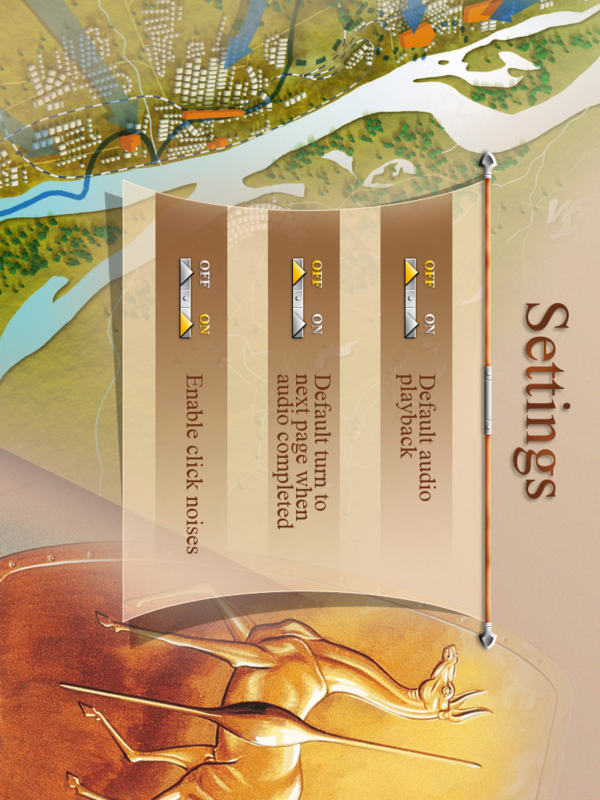 There are 6 buttons on the top right corner that allow for navigation throughout the app. The buttons can be somewhat confusing to use because there’s no clear label for what they do. Although it’s pretty easy to understand what the photos and quiz buttons do, the other buttons can be difficult tell what they actually do. Other than that, everything else is very easy to find. D-day is a great app if you really want to learn about the important WWII battle, and although it’s lacking in some areas, it basically does what it says it does: creating an interactive experience for those who want to learn more about this battle. Very descriptive information in some sections. Reading aloud feature is very nice. Lacking in content in some sections. Somewhat difficult to navigate buttons.